While America is still a free country, Reince Priebus has taken it upon himself to try to use RICO style bullying tactics to force the candidates that ran for President and have not supported Donald, to do so. “Republican National Committee Chairman Reince Priebus said Sunday that it’s high time for Donald Trump’s former primary challengers to come on board and support his campaign—and suggested there could be trouble for them in 2020 or 2024 if they don’t. “Those people need to get on board,” he told CBS’ “Face the Nation.” “And if they’re thinking they’re going to run again someday, I think that we’re going to evaluate the process – of the nomination process and I don’t think it’s going to be that easy for them.” According to his news chat on Face the Nation on Sunday, September 18, 2016. Several of Trump’s former Republican primary opponents, including Ohio Gov. John Kasich, Texas Sen. Ted Cruz, and former Florida Gov. Jeb Bush have not endorsed Trump in the months since the GOP businessman secured the nomination. They have strong misgivings about the man, the course he has taken, the rhetoric, and hate-filled bullying he portrays daily. No one with a conscious could rightfully support a man who has shown no principles, integrity, morals or ethics, and for Priebus to use racketeering style tactics shows that the end of the Republican party is here. The call in the twitter sphere and other social media is to remove Reince Priebus and to vote for anyone, but those supporting Donald Trump in the November election. While Priebus was trying to secure a win, he secured the death of the GOP in return for a liberal RINO. 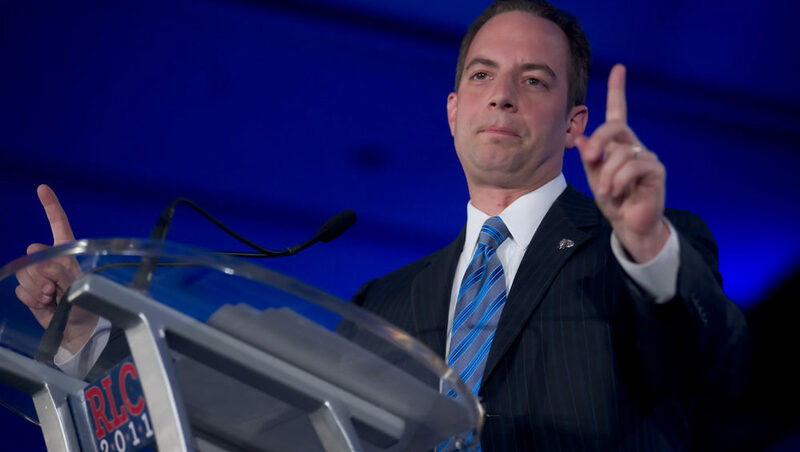 Reince on Sunday in one swoop destroyed the chances for many Republican down ballot contenders and guaranteed that the Democrats will win more seats in Congress, along with the Whitehouse. And with just over a week until the first presidential debate between Clinton and Trump, Priebus said he believes everything is “square” with the process. This summer, Trump claimed the process was “rigged” because two of the four scheduled debates would air during NFL games; at the time, Priebus told, “Face the Nation” there needed to be more “give and take” with the Commission on Presidential Debates. The debates might be square, but Priebus and Trump have guaranteed the end of the Republican Party as it was known prior to 2015.